The Global Volcanism Program has no activity reports for Galápagos Rift. The Global Volcanism Program has no Weekly Reports available for Galápagos Rift. The Global Volcanism Program has no Bulletin Reports available for Galápagos Rift. The Galápagos Rift is an oceanic spreading ridge between the Cocos plate to the north and the Nazca plate to the south. A large area of hydrothermal vents along the crest of the ridge ENE of the Galápagos Islands was discovered in 1977. The location listed here is the position of Clambake vent, which was surrounded by very youthful sediment-free flows of basaltic sheet lava. This position is at the northern limit of the location error circle for a 1972 earthquake swarm and only a few kilometers south of a concurrent fish kill (Macdonald & Mudie, 1974) that may have been associated with extrusion of these young flows. Morphology of the flows suggested that they were less than 5 years old (Chadwick and Embley, 1994). The Galápagos Rift at this point consists of a small rift valley 3-4 km wide with walls 200-250 m high. A low axial ridge formed by the youngest sediment-free lava flows rises about 20 m above the valley floor, flanked by older marginal ridges. A 2002 expedition discovered evidence for new lava flows covering markers emplaced in 1990. Chadwick W W Jr, Embley R W, 1994. Lava flows from a mid-1980s submarine eruption of the Cleft segment, Juan de Fuca Ridge. J. Geophys. Res, 99: 4761-4776. Corliss J B, Dymond J, Gordon L I, Edmond J M, Von Herzen R P, Ballard R D, Green K, Williams D, Bainbridge A,, 1979. Submarine thermal springs on the Galapagos rift. Science, 203: 1073-1083. Macdonald K C, Mudie J D, 1974. Microearthquakes on the Galapagos spreading centre and the seismicity of fast-spreading ridges. Geophys J Roy Astron Soc, 36: 245-257. Shannk T M, Hammond S, Fornari D, Waller R, Ding K, Seyfried W, Butterfield D, Lilley M D, Perfit M, 2002. Time-series exploration and biological, geological, and geochemical characterization of the Rosebud and Calyfield hydrothermal vent fields at 86° W and 89.5° W on the Galapagos Rift (abs). Eos, Trans Amer Geophys Union, 83: 1336. There is no Deformation History data available for Galápagos Rift. There is no Emissions History data available for Galápagos Rift. Submarine eruptions at mid-ocean ridges produce fresh lava flows like these "pillow" lavas, which form as lava slowly oozes out of a fissure on the sea floor. The E-W-trending Galápagos Rift, an oceanic spreading ridge between the Cocos plate to the north and the Nazca plate to the south, is located north of the Galápagos Islands. 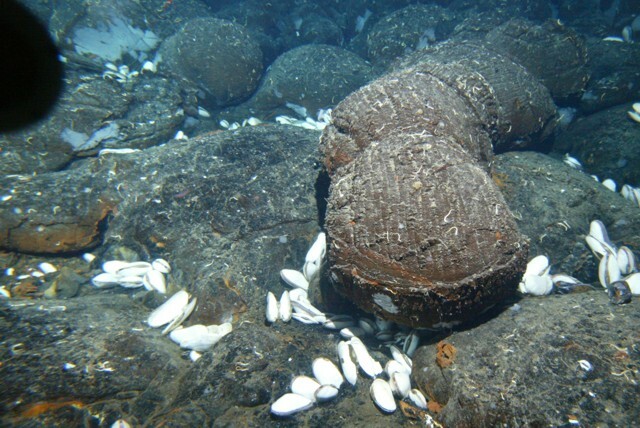 A large area of hydrothermal vents along the crest of the ridge ENE of the Galápagos Islands was discovered in 1977, along with evidence of a recent eruption. Image courtesy of NOAA Ocean Explorer, Woods Hole Oceanographic Institution. The Global Volcanism Program has no maps available for Galápagos Rift. There are no samples for Galápagos Rift in the Smithsonian's NMNH Department of Mineral Sciences Rock and Ore collection. Large Eruptions of Galápagos Rift Information about large Quaternary eruptions (VEI >= 4) is cataloged in the Large Magnitude Explosive Volcanic Eruptions (LaMEVE) database of the Volcano Global Risk Identification and Analysis Project (VOGRIPA).